Ferguson, who took the UFC interim lightweight title following a victory over Kevin Lee at UFC 216 earlier this month, wants nothing more than a showdown with McGregor. Aside from the monumental payday and title unification on offer, Ferguson wants to cement his legacy by inflicting what would be only the second loss of the 29-year-old’s UFC career. While looking likely to secure a bout with the promotion’s cash cow, many believe that he is in a two-horse race with the only man to have beaten McGregor inside the octagon, Nate Diaz. 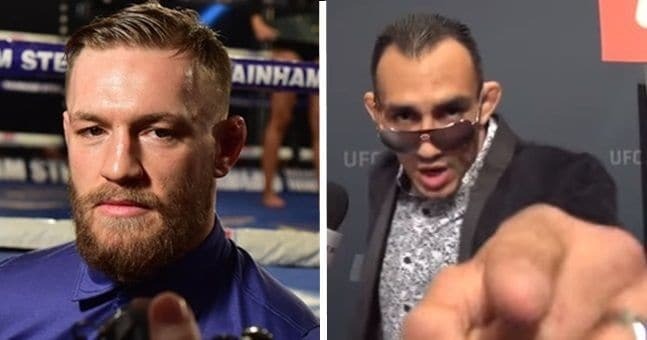 Fans and pundits alike are engaged in a debate regarding McGregor’s opponent for his return to MMA. Many argue that there only appear to be two candidates on the horizon and separate Ferguson and Diaz into two categories: Merit and Money. There is arguably no other fighter in the UFC who has done enough than Ferguson has to convince, yet failed to land a title shot. The 33-year-old would ride a ten fight win streak into a potential bout with the Dubliner having essentially cleared out one of the most stacked divisions in MMA. Diaz, 32, fought McGregor twice in 2016 before taking a year out from MMA. Having inflicted the first loss of his career on McGregor at UFC 196 he then pushed the Irishman as close as can get in their rematch at UFC 202, losing on the judges’ scorecards. Diaz may be 6-4 in his last 10 fights but has a larger fanbase than that of Ferguson. What makes Diaz the perfect candidate in the eyes of many is that the “rubber match” with McGregor would not just settle one of the UFC’s fiercest rivalries, it would be a guaranteed spectacle and the build up would be fantastic. “I think Tony is next,” Lobov told MMA Fighting. The only reason why I say that is it was unclear who was next for the title shot. There was Khabib, there was Tony and then Kevin Lee stood up. “In my head, Conor defends the belt against Tony,” said Lobov, who fights Andre Fili at UFC Gdansk on Saturday. “In the meantime, Khabib can fight the winner of Alvarez and Gaethje. Whoever wins that can be next. “I feel that same as Roddy. We saw him being rocked by Vannatta. It’s not that he’s not tough – he is – but he’s not as tough as Diaz. I don’t think he’s tough enough to last with Conor. He will get hit,” said Lobov. “Even with the first Diaz fight, it was never a skill issue. It was just his toughness and his ability to absorb the shots and then comeback. Skill wise, I think Conor dominated him. “I think the same thing would happen against Ferguson, except Ferguson isn’t tough enough. “In fact, I don’t think there is anyone as tough as Diaz out there who can take those shots at any weight, really.